Douglas Nielsen’s Adagio 2014 feels like modern dance’s expression of the human life cycle. The piece opens in stillness. But it’s a charged stillness, the kind one experiences when standing perfectly still before an audience: performing, yet doing nothing. Holding ground against overwhelming quiet. Dancers stand upright, facing the audience. Suddenly, they release a collective gasp. Arms shoot up over heads. They must have been counting all along, one reasons. Now, they have life and breath, and the piece becomes fluid. The music can start. It’s Samuel Barber’s “Adagio for Strings.” It’s a familiar piece of music, but Nielson’s choreography and the dancers’ structured improvisation give it new life. Nielsen, a choreographer and dance professor at the University of Arizona, is also an avid art collector. Adagio is inspired in part by Wassily Kandinsky’s 1937 painting Trente. The painting, whose title means “thirty,” is made up of thirty checkered squares, each containing an abstract expression of its own. For certain sections of Adagio, Nielson asks each of the dancers to improvise movement inspired by a particular square of Kandinsky’s painting. It’s a fitting homage to a synesthetic painter; one who saw colors when he heard music and attempted to express musical compositions in a visual medium. Orchesis, directed by modern dance veteran Diana Stanton, tends to pick a one-word concept for each annual performance. (Last year’s was Suspension; past themes have included Immersion, Torque, and Continuum.) Vitality is the theme of this year’s performance, which will run Jan. 30-Feb. 1 and Feb. 6-8 at the Alex and Faye Spanos Theatre. A crucial moment in Adagio toys with the fourth wall when dancer Brandon Takahashi leaps from the stage and the others gather round the edge of the stage in alarm, calling him by name. “Brandon, why are you down there?” cries fellow dancer William Bassett. Yet here the fourth wall is not totally broken, merely warped. The dancers still exist in a separate reality from the audience, even as they implore the crowd for help. They still seem to live on the stage like some dancer-tribe, fearing its edge as one would the edge of the Earth. I saw Adagio rehearsed in tight studio space, which didn’t allow the drama of Takahashi’s sudden drop to be maximized. With lights, costumes, and the benefit of the Spanos Theatre stage, the work promises to be electric. 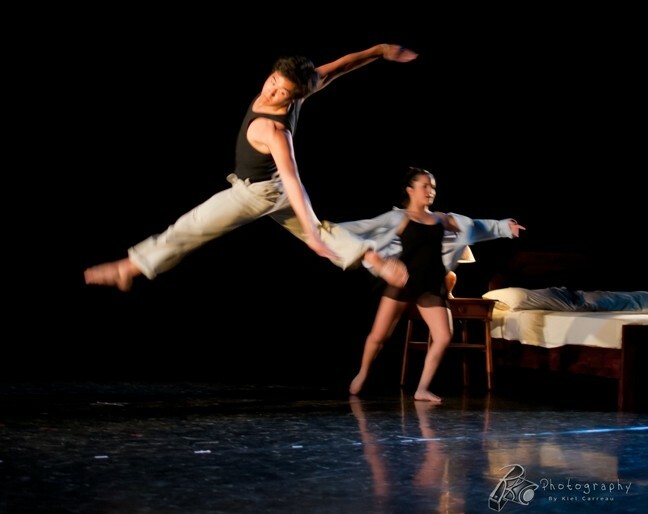 Dancer and choreographer Ryan Lawrence returned to his hometown of San Luis Obispo last year after a lengthy sojourn in New York, Chicago, and Rotterdam. His powerful piece Mourn, which shared the bill last April with the Civic Ballet’s Alice in Wonderland, grabbed my attention with its exploration of grief, celebration, and the concept of the performer as a paid mourner. Set to New Orleans funeral music, Mourn employed unusual props and striking visual symbols—dancers formed a great winged creature in the work’s finale, thundering toward the audience—to create a visceral experience. IT’S ALIVE! : Catch Orchesis Dance Company’s performance Vitality at the Alex and Faye Spanos Theatre at 8 p.m. Jan. 30-Feb. 1 and Feb. 6-8, with an additional 2 p.m. performance on Feb. 1. Tickets are $12-$20; visit pacslo.org or call 756-4TIX (4849). Tickled, Lawrence’s contribution to this year’s Orchesis program, displays the depth and unconventional thought process of Mourn while tackling totally different themes. Once again, the expressive Brandon Takahashi takes center stage in an opening section of the piece, this time in bunny ears, a mic in front of him, and dances manically to the standup comedy of Steve Martin and Tig Notaro, as well as the banjo-driven music of Martin’s band. A pre-recorded Martin talks about doing the same routine over and over again for two weeks, and Takahashi seems to embody the performer at his wits’ end, plastic smile resolutely affixed to his face. It’s as innovative (Dance to stand-up comedy? Why not?) as it is entertaining. Vitality includes several standout pieces by student choreographers, and it was in encouraging students to stretch themselves creatively that Orchesis director Diana Stanton found the framework for We Belong, her own contribution to this year’s program. Stanton had been asking students to move beyond the typical “music with lyrics, facing front, moving in unison” approach to choreography, she explained, and decided that, for the sake of variety, she herself would seek to create a piece that incorporated these “typical” traits. Stanton, who describes her choreographic style as “impressionistic,” describes We Belong’s opening section, set to the Rolling Stones’ “Paint It Black,” as an expression of personal demons—the insecurities that are exacerbated by observing others who, on Facebook, perhaps, appear to be having the time of their lives. A portion choreographed to Harry Nilsson’s “Coconut” is one Stanton envisioned as “a bad sorority nightmare,” using repetitive, pulsating movements to evoke an atmosphere in which individuals are constantly judging themselves against others, seeking to emulate or one-up them.